Rotary piston vacuum pump- Vacuum Pump - EVP Vacuum Solution! In the past of decades years, our company has conducted many new explorations, trials and researches on the overall structure of the slide valve pump and the structure of the main components. It has achieved very good results, has a certain practical value, and has been extended to related pumps. The structure of the slide valve pump is vertical and horizontal. The vertical structure has been rarely used in newly designed pumps, but it also has its own characteristics: the forward (backward) impact force of the pump during operation is relatively small, and most of the impact force is in the up and down direction. The front and back shaking generated by the pump during operation are very small. With this feature, as long as a suitable shock absorber or vibration damping pad is configured, vibration damping and vibration isolation can be effectively performed. We have conducted vibration tests on the H-8A rotary piston vacuum pump. The vibration test data also fully demonstrates this. Combining the above conditions, it is envisaged that the motor and the oil separator be located on the front and rear sides of the pump respectively, designed as a backpack type, lower the center of gravity of the pump, and add and subtract vibration pads at the foot of the pump, possibly becoming a vertical slide pump A future direction of development. The general structure of the horizontal structure is considered to be low in center of gravity and vibration, but it is not actually the case. At present, the most common structural form is to set a fuel tank above the horizontal pump body (an internal oil separator is installed), and then install a motor on the tank (see below picture “Pic. 1”). The floor space is small, but its overall center of gravity is increased. Therefore, it is very unfavorable for the vibration of the pump. We adopted an appropriate enlargement of the oil storage chamber of the horizontal pump body, and the oil and gas separator was changed to a suspended type. The motor was directly installed on the upper part of the pump body, and the overall height of the pump could be reduced by about 1/3. The ultra-low overall structure type greatly reduces the center of gravity of the pump and is very advantageous for reducing the vibration. See the below picture “Pic. 2”. This structure also allows the pump inlet position to be transferred from the side to the pump body, reducing the splash of oil at the pump inlet, which is conducive to the setting of the intake pipe; this structure can also expose the cover plate of the pump exhaust valve. 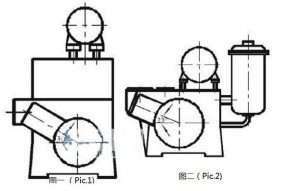 It is beneficial to the installation and maintenance of the exhaust valve; the suspended oil-air separator gives us sufficient space to facilitate the research and improvement of the oil-gas separation structure, save energy, reduce and eliminate fuel injection, completely eliminate soot, and avoid environmental pollution. It’s extremely important.